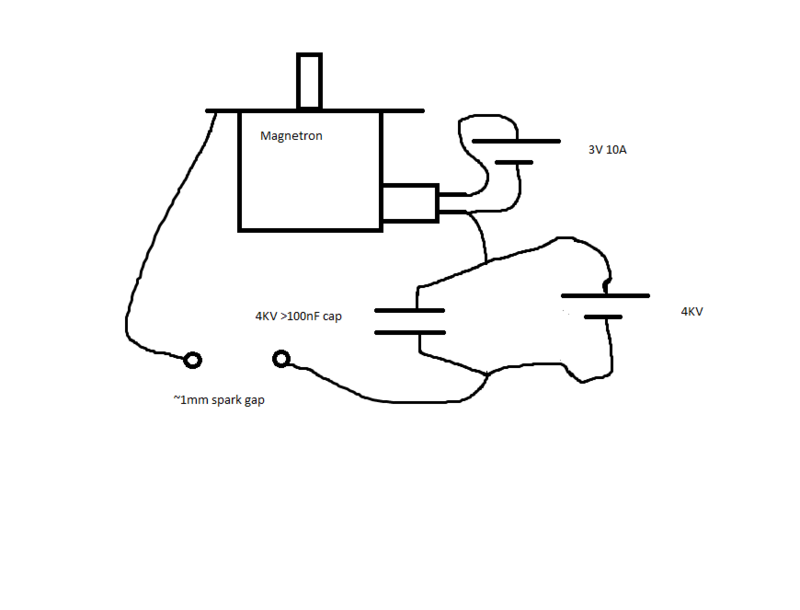 Powering a microwave oven magnetron with a capacitor, high voltage supply and a spark gap. The 4KV supply need not supply a high current. Aslong as the leakage current of the capacitor is less than the maximum current output from the power supply at 4KV, it will work. when the capacitor's voltage reaches 4KV, a spark jumps across the spark gap, supplying a short 4KV high current pulse to the magnetron. Spark gap should be adjusted to give best results. 2 microwave oven capacitors can be connected in series to give 4KV 0.5UF. The filiment requires about 3V at >10A. A suitable power supply for this is an ATX power supply. It has a 3V output. You could also use the 5V output therefrom, with resistor(s) in series to drop the 2V (~0.2R). hence exposure thereto is safe as the average power is <2W. However, these short high-power pulses of microwaves may damage sensitive electronics. The magnetron can be tested by placing a neon tube infront of the waveguide, it will glow dully if microwaves are emitted.